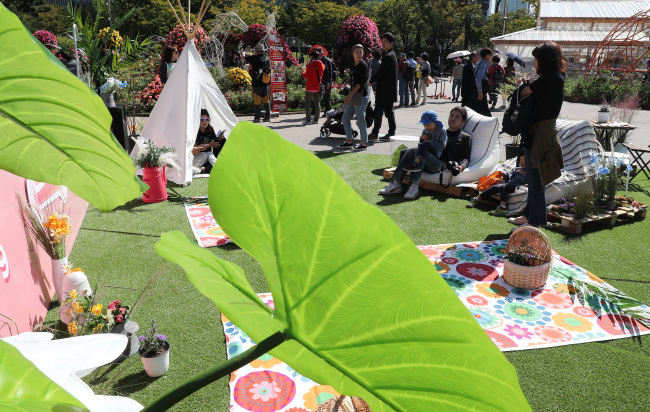 Seoul Garden Show kicked off Wednesday at Yeouido Park, aiming to offer a picnic-like experience for visitors. Around 95 gardens are spread across the park. Local and foreign garden designers created the small garden spaces, showcasing gardening trends as well as the hobby’s beauty. Thirty-two gardening equipment businesses have also set up booths, with parasols, benches, interior plants and home gardening products on display. “Yeouido Park used to feel empty because it is so wide. Today, the place is filled with more people than I expected and the place seems to be live with energy,” said Kim Sang-hoon, an office worker in Seoul visiting the park Wednesday. Various cultural events are to be held throughout the period at the main Picnic Stage. French art film “Faces Places” and Japanese animation “The Garden of Words” will be screened Friday and Sunday evening, respectively. Band performances, jazz music and busking will provide entertainment while gardening activities are offered for children. “‘Seoul Garden Show’ is more than just a display of gardens and an exchange of gardening culture. 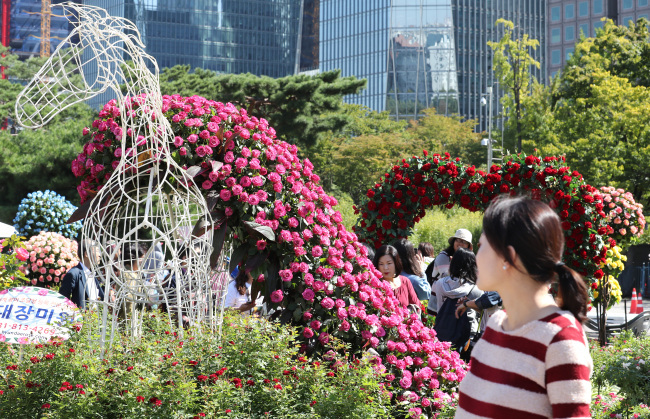 The show tried to share happiness through beautiful flowers and trees, for the people who are living a busy life,” said Choi Yoon-jong, the official from the Seoul Metropolitan Government in charge of the event. The show continues until Tuesday.